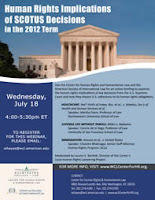 "Human Rights Implications of SCOTUS Decisions in the 2012 Term" is the title of a webinar to be held from 4 to 5:30 p.m. Eastern time this Wednesday, July 18. Sponsors are the Center for Human Rights and Humanitarian Law at American University Washington College of Law and the American Society of International Law, both based in Washington, D.C. The online briefing, on human rights implications of U.S. Supreme Court decisions announced last month, will be moderated by Lauren E. Bartlett, who directs the Local Human Rights Lawyering Project at the Center for Human Rights and Humanitarian Law. ► IntLawGrrl Connie de la Vega (right), Professor and Academic Director of International Programs at the University of San Francisco School of Law, who will discuss Miller v. Alabama. As posted, in that judgment the Court ruled 5-4 that the Constitution's 8th Amendment prohibits sentencing a child to life in prison without possibility of parole. Connie wrote an amicus brief in this case, as she has in many cases (see here) during the course of efforts to ease child sentencing laws. 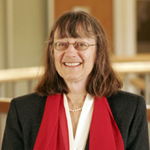 ► Martha F. Davis, Professor of Law at Northeastern University School of Law in Boston, who will discuss National Federation of Independent Business v. Sebelius. In that decision, as posted, Chief Justice John G. Roberts, Jr. led a 5-4 Court in sustaining the landmark health care legislation enacted in 2010, about which we've posted here, here, here, and here. Davis -- a faculty director for the Program on Human Rights and the Global Economy, which which IntLawGrrls Hope Lewis and Angela Duger also are affiliated -- wrote an amicus brief in this health care litigation. ► Chandra Bhatnagar, Senior Staff Attorney with the Human Rights Program of the American Civil Liberties Union, will discuss Arizona v. United States. As posted, in that case Justice Anthony M. Kennedy led a 5-3 Court in striking much of the state's restrictive immigration law. The judgment left in place, however, a "check your papers" requirement of which immigrants' rights advocates are especially critical. Central to Bhatnagar's practice are the intersection of racial justice and immigration, the use of international and foreign law in U.S. courts, and the domestic implementation of the International Convention on the Elimination of All Forms of Racial Discrimination. Details on the webinar here. To register, e-mail whayes@wcl.american.edu.